Illegal miners clash with police during a protest against a law criminalizing their activities (Photo from archives). Peru’s government has began legalizing tens of thousands of informal gold miners this week, in an effort to restrict an activity that has cost the country millions of dollars in lost fees and severely damaged the environment. However, about 40,000 of roughly 110,000 illegal miners ignored the Saturday deadline to legalize their status, evading government efforts to bring them into the formal economy. Over the past five years unregulated mineral extraction in the South American nation, especially gold mining, became an industry of its own, to the point experts calculated it was bringing more profit into the country than drug trafficking. The activity has also led to violence, pollution and the destruction of over 40,000 hectares of the country's Amazonic rainforest. In response to those challenges, Peru’s government launched in 2012 a program to incorporate illegal and informal miners into the system by April 2014. Minister of Energy and Mines Jorge Merino justified the measure saying Peru had reached a point of "no return" in the fight against the fly-by-night activity. While the Environment Minister Manuel Pulgar-Vidal told RPP radio (in Spanish) the process has been “a success,” President Ollanta Humala's administration has acknowledged that only a small fraction of the unlicensed miners have completed the complex process. This requires them to start paying taxes and filing environmental impact statements, among other requisites. To make it easier for the miners, authorities have decided to let them continue their work as long as they embark on the process of formalizing their operations, and only if they operate outside national parks and other protected areas. 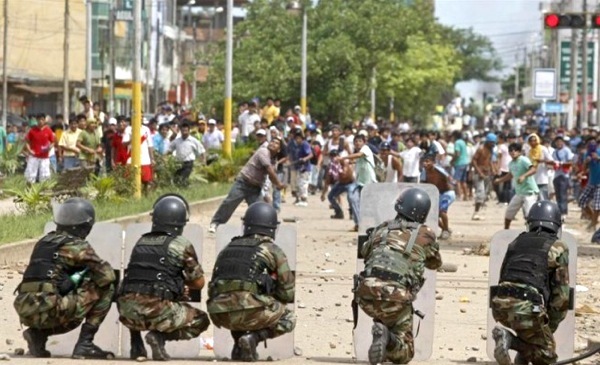 But fears of fresh confrontation between unlawful gold seekers and the government keeps growing as they already have been clashing with police while intermittently blocking traffic on the commercially vital interoceanic highway that links the Pacific coast with Brazil, AP reported. Peru is the world's sixth largest gold mining nation in terms of production.